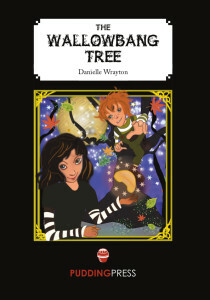 One fatal night young, Rosie Sparks’ world is turned upside down after listening to her granny’s strange but true tale of a magical tree, the Wallowbang Tree. Her dad disappears and in her subsequent adventure she encounters fiendish characters, but friends – new and old – help her on her quest to find her missing dad. As Granny Sparks pieces the puzzle together, she realises that she knows who might be behind Rosie’s dad’s disappearance and her own capture and imprisonment. Will Rosie ever find her dad? Will she ever save her granny? The answer can only be found in the great twisted branches of the Wallowbang Tree. The book has been reissued with a new cover.